Every year tax time rollings around and most people have their tax refund check already spent before they receive it. I kind of understand a nice $3,000 check comes your way and you get to spend it on whatever you want. 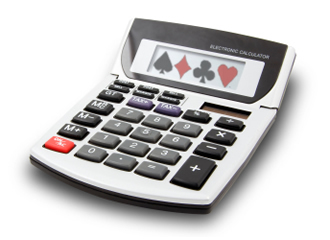 Why not use it to improve your poker game? Increase your bankroll, get one on one poker coaching, or buy a membership to an online poker training site. In this article, I will be going over the pros and cons of using your tax refund to improve your poker game. Why Use A Tax Refund For Online Poker? The answer to this question is very simple. If you’re new to poker or a losing player than it make sense to use money you were going to blow anyway. That way when you finally lose it, you don’t feel so bad. Now if you’re a break even poker player enjoying the benefits of the poker room VIP program than extra money play higher stakes to rake more. If you’re a winning poker player then more money in your bankroll will allow you to play higher stakes and win more money per hour. The average deposit for a beginner poker player is between $50 to $200. However, that bankroll never last long because of a few factors. The player has poor bankroll management and table selection. For some this means losing their whole bankroll within the first day. For long term poker players their bankroll might not be high enough to play at their stakes they want to play at and it seems to be taking forever to build up the bankroll to move up stakes without going against all bankroll management rules. To solve this problem, use some or all of your tax refund to deposit into your favorite online poker room. However, its recommended to find another online poker site to deposit into in order to take advantage of a welcome sign-up deposit bonus. This gives you a nice deposit bonus on top any rewards their VIP program offers. For example, Bovada Poker offers a 100% match up to $1,000 deposit bonus which is the best option for poker players from the USA and for the rest of the world, recommend going with 888 Poker which offers a 200% match up to $1,000 deposit bonus. For poker players that have an understanding of how to play poker online but slightly winning, losing, or breaking even. We highly recommend taking some of your tax refund to buy one on one poker coaching. The money will be well spent if you find a winning poker coach, keep a mindset focused on improving your poker skills, and work with your poker coach. The worse thing to do with a poker coach is hire a coach then act like you know everything about poker. Its a reason he’s a poker coach and you’re the student. The right online poker coach can take you from slightly losing to crushing the stakes you’re playing and if you improve enough you just might be moving up stakes. It’s not uncommon for a poker coach to help their student go from playing low stakes poker to mid stakes poker in a few months. Just recommend a good poker coach can cost anywhere from $100 to $400 an hour. This has to be the smartest thing you can do besides depositing more money into your online poker account. A poker training site has tons of training videos you can watch to improve your poker game without paying large hourly fees to a poker coach. Most online poker training sites have a small monthly fee of $20 to $50 per month. The cost of a year membership to a popular training site like PokerStrategy or BlueFirePoker is the same cost of an hour with a online poker coach. The smart way to go about improving your poker skills is first buy a membership at an online poker training site. Get an understanding of the game, improve your knowledge of bankroll management, table selection, position play, and etc. Second, make a deposit that will give your bankroll a real bonus like $500 or more. Now once you have watched all the poker training videos you can watch and learn as much as you can from watching videos. Then its time to hire a poker coach to have some one on one time. Find leaks in your game, plug the leaks, improve your skills, and most importantly win, win, WIN! Founder/CEO of MDG, professional writer, and sports handicapper as well as small stakes poker player.